Walter Broadnax, Distinguished Professor Emeritus of Public Administration and International Affairs at the Maxwell School, will deliver the keynote address at this year’s M.P.A. Convocation. A faculty member at Maxwell since 2008, he has had a long and distinguished career in public administration and public policy as both a practitioner and an academic. Before joining the Maxwell School, Broadnax served as president of Clark Atlanta University, dean of the School of Public Affairs at American University and professor at the University of Maryland. He oversaw the restructuring of the Social Security Administration during his tenure at the Department of Health and Human Services from 1993 to 1996. He also held key positions in state government, among them president of the New York Civil Service Commission and director of Children, Youth and Adult Services for the State of Kansas. 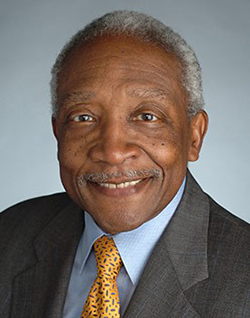 In 2015, Broadnax was appointed a Life Trustee on the Syracuse University Board of Trustees. He received a Ph.D. in public administration from Maxwell in 1975. The convocation is scheduled to begin at 10 a.m. on Friday, June 26, in Hendricks Chapel, with a reception afterward on the Quad.